One firebox, 2 adjustable grill grates and 550 square inches of cooking space, the Dual Grate Family Size Pedestal is practical and versatile. 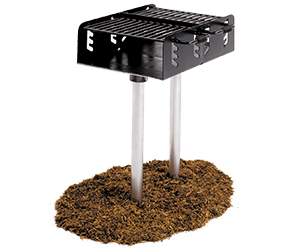 Designed to be ultra-durable, the 20" x 28" x 8" campstove is fabricated with 10-gauge steel walls, a 7-gauge steel base and finished in a non-toxic, high temperature, rust-resistant black enamel. The firebox also features pre-configured grooves, which allow the cooking grates to individually adjust to 4 convenient levels. Each grate is constructed with 1/2" steel bars, supplemented with 5/8" steel support bars and feature cool coil spring grip handles. To ensure the safety of users and surrounding spaces, the MIG welded park grill requires in-ground or surface mount installation of the dual 3-1/2"O.D. steel pedestal posts.